Spring is right around the corner (I promise!) and spring time usually means MOVING SEASON! Often, people will move to a smaller house, or a cheaper neighborhood in order to help cut their cost of living. But the process of moving itself is an EXPENSIVE endeavor if not navigated properly. Here’s how to keep your move on the cheap side, and how to avoid being swindled by companies looking to make money off of you. Don’t be taken advantage of! 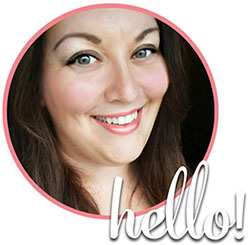 I am going to share my secrets with you for how to move on a shoestring budget. Tip #1: Don’t pay for boxes! Places like U-haul charge a premium for their boxes. You don’t need them! Many places will let you take boxes for free, you just have to ask! Try liquor stores, fast food restaurants and even copy stores, such as FedEx Office. They go through hundreds of reams a paper a week, and have plenty of empty paper case boxes, often with lids, that they are willing to give to you for nothing. Just make sure you ask and don’t go digging through dumpsters without permission. Tip #2: Don’t let that truck sit! Moving needs to be organized and orchestrated correctly in order to go off without a hitch. This includes planning ahead. 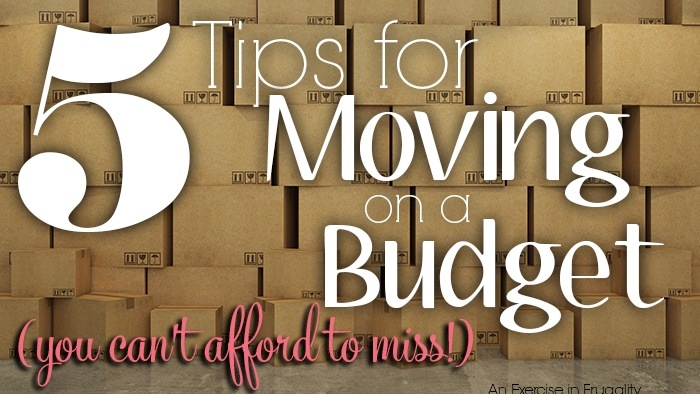 One great way to save money is to have your stuff packed BEFORE your moving truck pulls up. Paying for movers to pack for you is a wasteful expense, as well as renting a self-service moving truck (for which you pay by the day) only to have it sit empty in your driveway while you pack up your house. Have your belongings ready to go when the truck pulls up and start loading immediately. Tip #3: Don’t Pay For Unnecessary Extras! When you rent a truck, or hire movers, they try to throw on all sorts of a-la-carte extra items: dollies, furniture covers, bubble wrap, etc. Even truck insurance. Check with your car and homeowners/renters insurance first to see if your rental truck is covered before you pay extra for it through the rental company. Also-chances are you can find better deals on those other supplies elsewhere. Sure a dolly might be handy, but if you have someone who can borrow one from work, or even substitute a little red wagon, it will save you the premium that the rental company will try to charge. Stock up on your other packing supplies on Amazon where you can find them cheaper. You can get good deals on packing tape and bubble wrap! Tip #4: Get All Costs UP FRONT! Don’t let the stress and whirlwind of moving catch you off guard. Use common sense and carefully read through any contracts or agreements with rental companies before you sign them. Some less-than-scrupulous companies have been known to take advantage of people who are frenzied by their move, and then you’re stuck. Don’t let it be you! Take your time and read contracts thoroughly. Tip#5: Wrangle Up Some Free Labor! Chances are you have a nephew in college or a high school age family friend who is willing to work for next to nothing. I have two younger brothers who usually help me move for the cost of pizza, and now that the older one is of age…beer! If you’re looking to keep the cost even cheaper, see what kind of coupon deals you can get and do a big pasta feed for your moving helpers. I took advantage of the free Starbucks Refreshers coupons and loading up on those and pasta to feed my moving helpers in a few weeks (can’t beat free energy drinks to get your moving help moving!) Don’t be shy to ask friends. I am getting help from one of my good friends in exchange for my help when he moves next month! Free exercise! 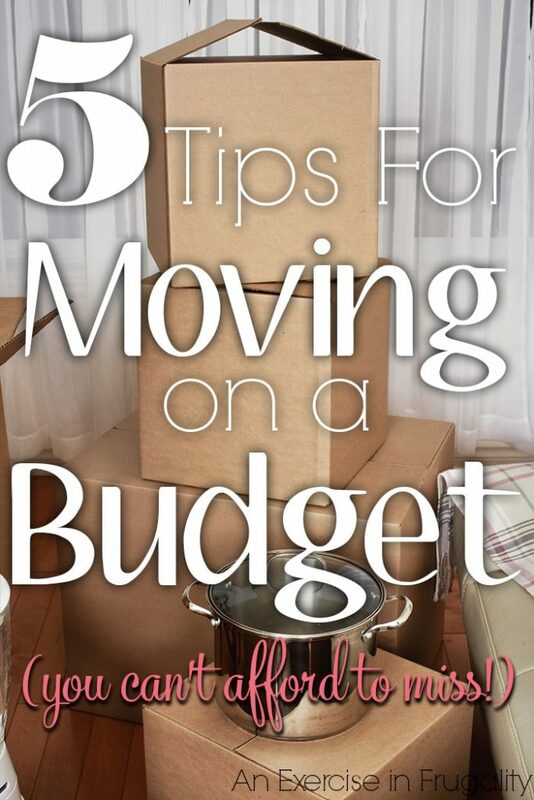 What tips and tricks do you have for saving money when moving?